In 2017, we explored the latest trends in the take-out food market via a series of bi-monthly blogs. From Tempura and Bento boxes to fried chicken sandwiches and spiralised vegetables – our blogs revealed the latest must-have dishes, with helpful advice on how to package them for consumption on-the-go. As we reflect on the trends that dominated 2017, two common themes stood out, and these were (rather contradictorily) healthy eating and indulgence. We’ve taken a closer look at these themes, exploring how they influenced our food menus in 2017 and what impact they might continue to have in 2018? In 2017, consumers demonstrated an increasing awareness of the calorie and sugar content in their foods, evidenced by a rise in popularity of healthy foods like spiralised vegetables, smoothie bowls, soup diets and bento boxes. The rising numbers of people choosing healthier options could have something to do with recent findings published by the World Health Organisation (WHO) last year, which linked processed meats, like bacon and ham, hydrogenated fats, sugar and refined carbohydrates to cancer. Unsurprisingly, just a few months later after this report, MyFitnessPal, an app that allows you to track your calorie intake, revealed that their active users had increased from 110 million active users to 175 million. The increase in healthy eaters has also been supported by a growing number of health-conscious bloggers – who encourage consumers to swap their everyday favourites, like pasta, for healthier alternatives. Ella Woodward, who writes Deliciously Ella’s blog, was diagnosed with Postural Tachycardia Syndrome, and she claims that a free from and vegan diet has helped her to monitor her illness. Kris Car, a vegan chef who has been living with terminal cancer for 14 years, says on her blog that a vegan diet has kept her alive, and she’s now feeling healthier than ever. The National Health Service (NHS) website advises swapping foods for healthier alternatives is the healthiest and most achievable way to lose weight. For example, spiralised butternut squash instead of spaghetti or grated cauliflower (also known as cauliflower rice) instead of rice. 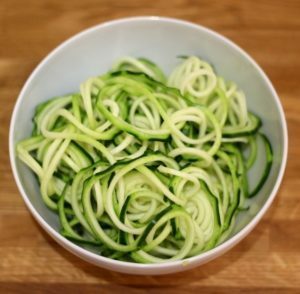 Spiralised vegetables have been at the forefront of this revolution due to their uncanny resemblance to pasta when spiralized. Many chefs and healthy lifestyle bloggers have raved about the benefits of eating them, they are full of fantastic nutrients, they fool our bodies into thinking it’s just had a bowl full of pasta, and they have fewer calories and fats than pasta. In 2018, healthy fast-food operators will continue to gain popularity. They’ll act as a hub for consumers choosing to live a healthier lifestyle – where they can grab a super-fruit packed smoothie, fresh seasonal salad, and have a decent choice of plant-based , organic dishes. 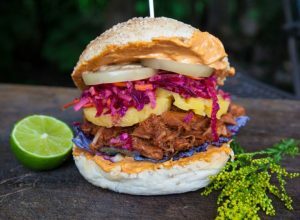 In 2018, we predict that healthy dishes that swap meat for veggies, like beetroot burgers, tofu hot dogs and jackfruit pulled “pork” will feature on menus – a sure hit for a growing customer base with good-health top of mind. On the other end of the spectrum, 2017 saw the rise of a number of indulgent, calorie heavy, mega-dishes like freakshakes, fried chicken burgers, gourmet popcorn, rolled ice cream and poutine. 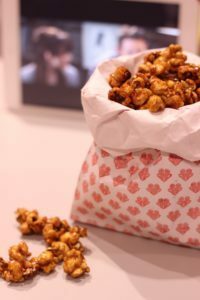 According to research website Canadean, in 2017 consumers spent £650,707 million on indulgent food products, compared to only £416,566 million on healthy options. Indulgent, calorie laden food options have become so popular with consumers that on Instagram eighty-five per cent of the accounts have shared at least one food image. Typically, the most common food items were calorific foods such as candy, cookies, freakshakes and cakes, whilst only 22 per cent of the pictures displayed fruits and vegetables. One of the most popular indulgent food trends of 2017 was the freakshake. Freakshakes consist of a traditional milkshake base topped with cream, cake, biscuit, chocolate, strawberry sauce, sweets and anything else that’s sweet and yummy. 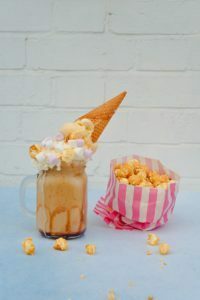 The end result is gravity defying – an overflowing milkshake of gargantuan proportions. So what’s in store for us in 2018 – and what should catering operators start thinking about for their new spring menus? In their latest food report, supermarket Waitrose predicts that Japanese small plates, Indian street food, the fourth meal and vegan proteins will be the top food trends in 2018. 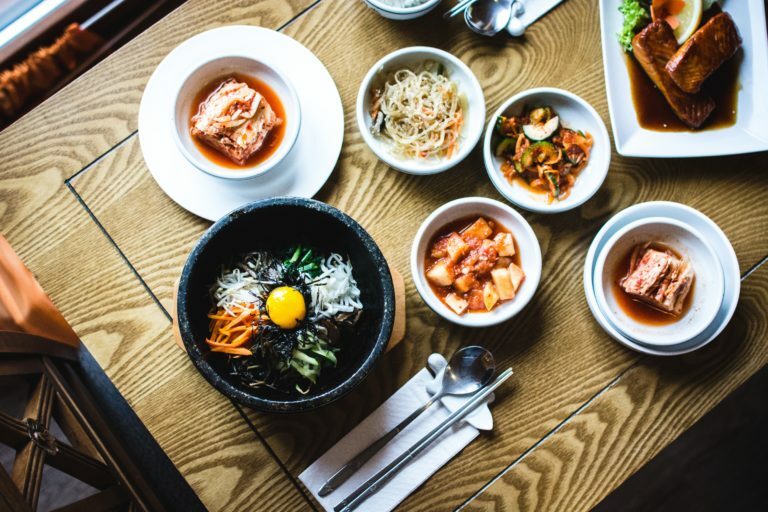 In a new series of Innovate blogs we’ll be exploring cuisines from around the world, including Korean BBQ food and Spanish Tapas. We expect Korean BBQ food to become extremely popular in 2018, with dishes like Bibimbap, Bulgogi and Galbi appearing on menus in London. We’ll also be running a number of blogs dedicated to on-trend drinks – like nitro coffee, chia drinks and the Kombucha Health drink. Kombucha is made by fermenting tea and sugar and the result is something between a sparkling apple cider and champagne, depending on what kind of tea you use. 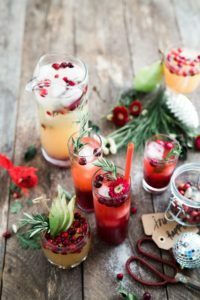 Watch out for our new ‘world cuisine’ and ‘on-trend drinks’ blogs coming soon.